With speculation at the quarterback position heading into their 2018 campaign, the Indianapolis Colts addressed other positions of need through free agency, most notably by signing a couple of pass-catchers and bolstering their front seven. Eric Ebron joins the team at tight end while Ryan Grant inked a big deal with the Colts at wide receiver. Denico Autry heads to Indy from Oakland at interior defender while Najee Goode comes over from the defending champion Philadelphia Eagles. T.Y. 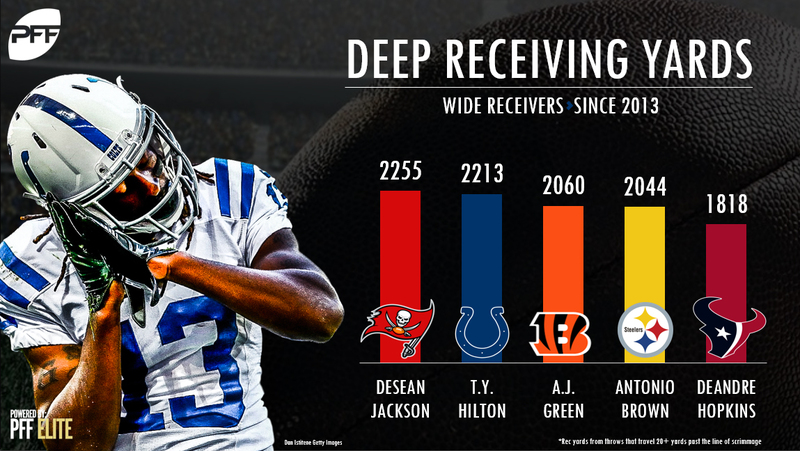 Hilton returns as he has quietly become one of the more productive deep pass-catching receivers over the past few seasons. Where the Colts go in the 2018 NFL Draft is still up in the air, but they will almost certainly have to address the issues of depth on defense after the loss of CB Rashaan Melvin (Oakland), edge Barkevious Mingo (Seattle) and Jon Bostic (Pittsburgh). The aforementioned trio combined for 1,967 defensive snaps last season and will be sorely missed from key spots on defense. Add in the fact that Indianapolis lost WR Donte Moncrief and RB Frank Gore on offense, and it makes the upcoming draft that much more important to address issues on both sides of the ball. With this movement across the board, what do PFF Senior Analysts Steve Palazzolo and Sam Monson think of their offseason so far?